The alert, the sixth of the winter season, prohibits burning wood, manufactured fire logs or any other solid fuel both indoors and outdoors for 24 hours, agency officials said. The alert has been issued as cool, stagnant weather conditions are trapping wood smoke pollution near the ground throughout the region, causing unhealthy air quality. 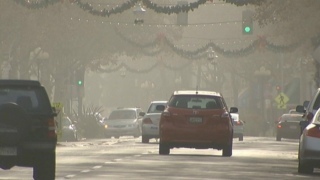 "The Lunar New Year coincides with the cold, still conditions that cause wood smoke pollution to build up," the air district's Executive Officer Jack Broadbent said in a statement. "Wood smoke, combined with fireworks and firecrackers from the celebrations, is causing unhealthy air to be trapped in neighborhoods in the Bay Area," the statement said. Exemptions for the alert are available only for homes without permanently installed heating, where wood stoves or fireplaces are the only source of heat. Anyone whose sole source of heat is a wood-burning device must use an Environmental Protection Agency-certified or pellet-fueled device that is registered with the air district in order to qualify for the exemption. Wood smoke from Bay Area fireplaces and wood stoves account for the single largest source of air pollution in the region and exposure to it has been linked to respiratory illnesses and increased risk of heart attacks, air district officials said. For more information about the Spare the Air Alert rules, residents can visit sparetheair.org or call (877) 4NO-BURN (466-2876).